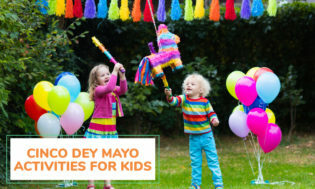 Here you are going to find an extensive list of Cinco De Mayo Games and activities for kids. 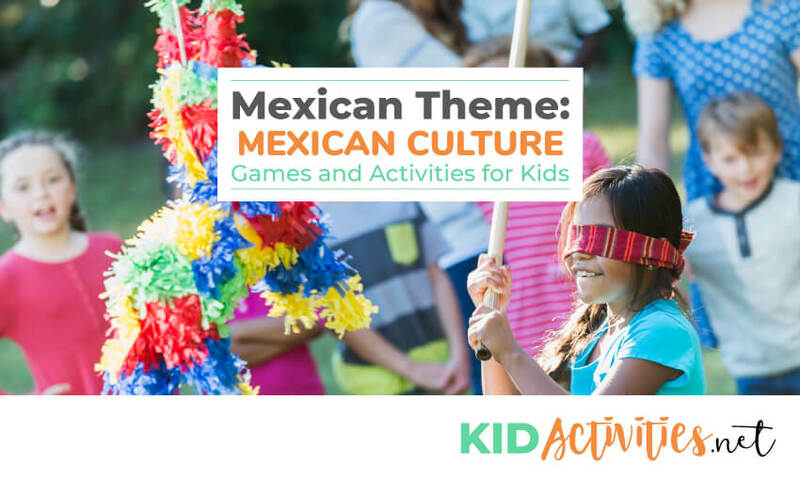 These Mexican themed activities will help kids learn about Mexican culture but also enjoy hours of fun and entertainment. GREAT FOR CINCO DE MAYO or FIESTA! Art, Crafts, Games, Snacks/Recipes, Simple Greetings/Phrases, and more! 1. Blow up a large balloon and tie the end securely. 2. Mix flour and water together until it makes a smooth paste. 3. Cut newspaper into long 1 inch thick strips and dip into the flour and water mixture, creating paper Mache strips. 4. Carefully place the strips of newspaper on the balloon in a single layer, patting the paper smooth until the balloon is covered, leaving only a hole at the top large enough for candy. Set aside and allow the balloon to dry completely overnight. 5. Place another layer of newspaper strips dipped in the mixture over the balloon and let that dry. Repeat with yet one more layer, making sure you leave the hole at the top. When completely dry, pop the balloon, and remove any balloon bits that remain. 6. Use wadded paper, lightweight wire shapes or smaller paper Maché covered balloons to create noses, ears, arms, legs or other details to make your piñata into the shape you want. 7. Paint your piñata, or cover it with layers of bright tissue paper in colors to match your party theme. 8. If desired, hang colored crepe paper from the sides and bottom. 9. Punch 2 small holes in the top near the opening and string a large piece of string through the two holes. 10. Fill your piñata (through the hole you left at the top) with candy, toys, or any other fun surprises. Mix the treats with strips of newspaper or small wads of tissue paper to keep the treats spread throughout the piñata. 11. Tie your completed piñata in the air with the string and have fun! TIP: Those who know how to make a piñata have learned not to make the paper Mache layers too thick or the piñata will be nearly impossible to break! 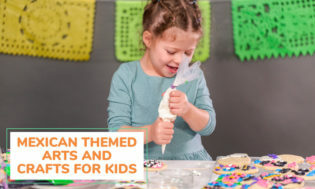 You can be creative with this project – your piñata can be almost any color or shape you can imagine. Don’t worry about your artistic skills, or craft experience. Anyone can learn how to make a piñata. It’s a great group project and a wonderful way for to have fun preparing for a party together. This is a very simple version of a Piñata making it a suitable craft to do with large groups of children. It’s much less messy than the Paper Maché version. Glue the strips around the bag, starting at the BOTTOM — only glue the uncut part, don’t get any glue on the fringes. When you glue on the second strip, overlap it so it comes about to where you cut the fringe. Repeat until you’ve covered the entire bag –again leaving about 1 inch free at the top. Punch holes all the way around the top of the bag. Lace a piece of string or yarn around the holes and pull tight (You may need to pull out a bit of the newspaper or add a bit extra at this point). Tie in a loop so you can hang it. Cut 4 or 5 long strips of tissue paper and glue them to the bottom of the bag as streamers. When all the children have made their piñatas, you can hang them up for decorations OR you can let them whack their bag with a stick until their candy falls out. Just let the kids create!!! 1. Going horizontally, wrap the water bottle from top to bottom with masking tape. If using colored masking tape, alternate the colors to make a bright design. 2. If using plain masing tape, decorate the maraca by drawing or painting designs on the masking tape. 3. Fill the water bottle half-way with popcorn or dried beans. Replace bottle cap and shake! 1. Paint the craft sticks black. 2. Decorate the sticks and the containers using colored vinyl tape. 3. Cut a slit in the tops to hold the craft sticks securely. Fill containers half full with rice, beans or beads. Replace the tops. 4. Push in the crafts sticks. Source: Dawn of Morganton-North Carolina. 1. Have kids paint their paper plates (eating-side down) any color and design they choose. The brighter the better! 2. Once paint is dry, fill one paper plate with dried beans, popcorn kernels, or anything that will make noise. 3. Glue the paper plates together…and shake! Optional: glue or staple long crepe paper streamers if desired. 1. Give children construction paper/card stock and several colors of thick tempera paint in shallow dishes. 2. Place the paper in a shallow box- then dip the beans in the chosen paint color and use a spoon to scoop it out. Place beans on the paper. 3. Hold the box tilting it back and forth as the beans move across. When there is no more paint, dip the beans again or get a scoop of beans in a different color. 1. Look for cans that have plain sides without any ridges. These make the nicest lanterns. Remove the label from the can. Scrape and clean any glue that is still on the can. 2. Draw a pattern of dots on the outside of the can with a permanent marker. Be careful NOT to smudge the dots before the ink is dry. Challenge kids to come up with patterns such as stars, flowers, circles, etc. 3. Fill the can with water and put in freezer for at least 24 hours-until frozen solid. 4. Place the can on its side on a folded towel. Use assorted nails (also screw driver tips make a nice look) to pierce through the pattern of dots that have been drawn. Hammer the nails in just far enough to pierce the metal. If the ice is melting too quickly, return the can to the freezer for a few hours. 5. When done, melt the ice in the can. Dry the lantern. Caution the children to take care and not cut or scratch themselves on in edges inside of the can. Pierce a pattern of holes in the metal top of a frozen juice can. (The lids that are held in place with a plastic strip have the smoothest edges.) Place the lid on a work surface that can sustain the pounding of nails. Besides the design, pound a hole in near the top of the lid to string fishline or yarn from which to hang. Several lids hung together make a nice mobile. This is a simple craft made from a paper plate and a child’s hand print cutouts. These would surely add to the ‘Fiesta’ spirit when hung about the room! 1. Paint the front side of a paper plate yellow. 2. Trace child’s hand on yellow construction paper about 7 times. 3. Cut out the tracings. 4. Glue or staple the hand print tracings to the backside of the plate – the fingers are the sun’s rays. 5. Color in the sun, drawing a mouth and a nose. Either draw the eyes or glue on googly eyes. PAINT SMALL TERRA COTTA POTS with acrylic paints. 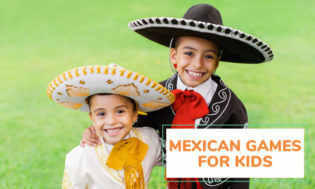 Have kids decorate them with popular Mexican symbols such as a sun, Mexican flags, sombreros, cactus, maracas, etc. 1. Place the bag-seam side up. Starting at the bottom cut straight up the seam …cutting into a “V” and then a hole in the bottom of the bag (this is the neck hole). 2. Cut about a 5-inch wide strip from each side of the bag. This makes the open sides of the serape. 3. Make a fringe around the bottom by either cutting slits all around the edges, or by punching holes along the bottom and threading pieces of yarn through. 4. Turn the serape inside out, so that the print is inside, and the side that is showing is plain brown. You may need to secure the shoulder area (the bottom of the bag) with masking tape. 5. Lay the serape out flat, and paint with bright colors! “Cascaron” is the Spanish word for eggshell. They are used in many celebrations including Easter, Christmas, Birthdays and Cinco de Mayo. In San Antonio, the “confetti-filled eggs,” are sold in stores and is a basic part of Fiesta. 14. DO THE MEXICAN HAT DANCE! Cut a large circle from construction paper and use a marker to draw the features of a Mexican sombrero. At chorus, link elbows with a partner and skip around in a circle. Circle once, and then circle the opposite direction. Repeat with a different partners throughout chorus. Or…the entire circle can circle one way-and then the other. Variation: You can call childrens’ names one by one. When a child’s name is called he/she will come to the center of the circle and do a dance. 1. Divide students into two or more teams and have each team form a line. 2. Give each team a long red balloon (their “chili pepper). 3. Kids pass their chili pepper down the line as quickly as possible. The first player passes it between his legs, the second over her head, the third between his legs, and so on. 4. When the pepper reaches the last child, they race to the front of the team’s line and start the chili pepper down again. 5. The relay ends when the first player from one of the teams reaches the back of his team’s line, gets the chili pepper, and returns it to the front of the line. 17. PLAY ‘PIN THE TAIL ON THE BURRO’! (Donkey) Or….PUT THE FLOWER ON THE CACTUS! … a traditional game played in Mexican villages; it’s a great fiesta outdoor game for teams and large groups of kids. Each team member takes turns kicking a ball (no hands!) around an obstacle course. The first team that has all players complete the course is the winner. Set the obstacle course to reflect the age of kids. Example: around tables and chairs, a tire, logs, or tree. Kick over and under things–whatever is available to make a course. Take a Mexican, Fiesta or Cinco de Mayo related word such as guacamole or festival. Challenge the children to find as many little words as they can. Words: came, come, me, am, game, gem, cue, male, meal, mole, mule, ace, camel, coal, lag, camel, go, goal, coal, etc. This is played much like the game “Freeze or Statues”. Play Mexican music. While the music is playing, the children jump around like “jumping beans”. When the music stops–all must stop moving. Anyone caught moving is out-the last remaining ‘jumping bean’ is the winner! 21. ESTIMATION: HOW MANY BEANS IN THE JAR? 1. Have children write their name and guess on a small piece of paper. 2. Have them place the number of beans guess in a container or sombrero. 3. The correct of closest guess is the winner! 22. Play ‘HIDE AND SEEK’ IN SPANISH! It’s best played with lots of places to hide. The person who is the counter (or seeker) stands next to a designated tree and close their eyes while counting to ______. The rest of the players run and hide. When the seeker is done counting, they call out “Ready or Not, Here I come!” and begin searching for everyone else. The goal for those hiding is to get back and touch the tree before being tagged. Those who are tagged before touching the tree are also “It” and join the seeker. The last one to reach the tree or be tagged is the seeker for the next game. A popular sport in Mexico. Get a good game of FUTBOL (soccer) going! Still an all time classic and popular in Mexico. Get a variety of marbles in different sizes and colors — have kids play this traditional game. Another nostalgic game that is a classic and one of the oldest games in the world. In the early days the game was played with whatever was on hand such as stones, crumpled-up paper, sticks, etc. ‘Jack game sets’ are still easy to find. Set of jacks and ball. Smooth surface to play on. 1. Begin by throwing your jacks onto the ground in front of you. Try and make the jacks land not too far apart or too close together. 2. Next throw the ball into the air and pick up one jack. Catch the ball after it bounces one time. Continue picking up the jacks one at a time. 3. When you have collected all the jacks, throw them again and start picking the jacks up two at a time (twosies). When you get to threesies you have to pick up the three sets of three first, then pick up the left over jack. Continue on until you are at tensies. You can then declare the winner as the first one to tens, or go back down again to onesies. Your turn continues until you either–miss the ball, fail to pick up the jacks, move a jack, or drop a jack that you have picked up. Your turn is then over and the next person goes. Go from one to tens without letting the ball bounce before you pick up the jacks. Pick up the jacks and then catch the ball after it bounces twice. Switch the hand you normally throw the ball with. Cup your hand and throw the ball with the opposite hand. You have to then place the jacks in your cupped hand – one through tens. After you throw the ball you have to make a circle in the air around the ball before it bounces – one to tens. Give each child an identical list of Spanish words. Each child guesses the meaning of each word. Who ever guesses the most correctly is the winner. Tip: Try not to make the words too difficult or have them link to English words. 27. TEACH THE KIDS TO COUNT FROM ONE TO TEN IN SPANISH! • Hang a pair of maracas or a sombrero on your front or program door to welcome fiesta spirit! FOR CENTERPIECES…Use COLORFUL VEGETABLES such as: yellow peppers, red peppers, red chilis, green chilis, avocados, and tomatoes. 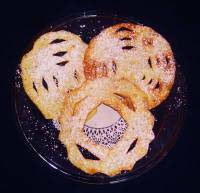 Made with either corn or wheat flour, these flat rounds are a staple of the Mexican diet. Combine 2 cups masa harina (corn flour) and 1 teaspoon salt in a large bowl. Gradually add 1 ½ cups warm water and mix with your hands until mixture forms soft dough. Form into 15 equal balls. Flatten each ball into a thin 6-inch circle. Fry tortillas in a dry pan over medium-high heat for about three minutes, turning once. Serve warm. Makes 15 tortillas. Warm the tortillas slightly in the microwave so you can fold them. Next fold the tortilla into half, then half again. Cut out designs…or cut in wedge shapes. 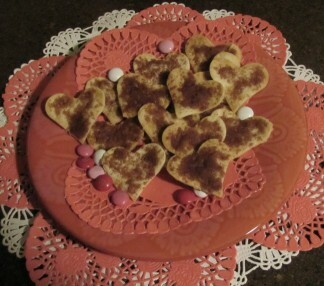 Using small fun shaped cookie cutters (These are from Valentine’s Day– but can be shaped for ANY time of the year) cut shapes out of a flour tortilla. They can also be cut by hand in strips. Place on non stick cookie sheet and lightly brush with a little melted butter. Place the tortilla on a plate and sprinkle 2 tbsp cheddar cheese on 1 half of the tortilla. Place the apple pieces over the cheese. Then sprinkle 2 tbsp cheese over the apple pieces. Fold the tortilla over the filling. Microwave on high, for about 1 minute. Cut the tortilla in half and serve. 33. VELVEETA CHEESE DIP (Made on Stove or microwave and good anytime! BEAT Neufchatel with mixer until creamy. Add seasoning mix; mix well. Spread onto bottom of serving plate or 9-inch pie plate. TOP with all remaining ingredients except chips. 1 pkg. (8 oz.) PHILADELPHIA Cream Cheese-softened, 1 cup canned black beans-rinsed, 1 can (10 oz.) Diced Tomatoes & Green Chilies-drained, 1 cup KRAFT Mexican Style Finely Shredded Four Cheese. Variation: Serve the dip mixed. Beat cream cheese with mixer until creamy. Add remaining ingredients; mix until well blended. Cut the avocados into halves. Remove the seeds, and scoop out the pulp into a small bowl. Use a fork to mash the avocado(leave it a little chunky). Stir in lemon juice, onion, tomato, salt, and olive oil. Cover the bowl, and refrigerate for 1 hour before serving. Serve dip with corn chips, tortilla chips or a variety of fresh vegetables. 1. Spread about 1 TBS peanut butter over each tortilla. 2. Place fruit slices down center of each burrito. 3. Drizzle about 1 TBS vanilla yogurt over fruit. 4. Kids love to design & roll their own burrito. Roll up the tortilla, burrito-style (Fold up one side, tuck under fruit, fold up bottom, then roll the other side). With the help of an adult, preheat oven to 400 degrees F (204 degrees C). Slice the baguette in half, lengthwise. Then, cut it into thick pieces. Spread with the beans and top with cheese. Place on a baking sheet and bake for about five minutes, or until the cheese melts and the beans are hot. Top with pico de gallo. 41. SET UP A ‘TACO BAR’! Put out bowls of cheese, shredded lettuce, salsa, chopped tomatoes, taco meat/chili, grilled chicken, refried beans, sour cream, guacamole, avocados and chives. 2. TO MAKE TORTILLAS: Brush the tortillas with butter, and then cut them into wedges. Sprinkle with Parmesan cheese and toss to coat. Toss with cheddar cheese just before serving. Makes 10 servings. You can also make nachos, burritos, chili or chili soup! Add a great big TROPICAL FRUIT SALAD! Don’t plan your party without this refreshing drink. Pour one can of Sprite (it doesn’t have caffeine) into a blender, along with small ice cubes. Add several large strawberries, a handful of blueberries, or other favorite fruit to the mix. Blend the mixture until it has the texture of slush. Pour into a glass and garnish with a cherry on top. The tropical flavors of pineapple and coconut are perfect together blended with ice. Blend ingredients until ice is slushy. Pour into frosted glasses and enjoy immediately. Garnish with blueberry skewers spiraled with thin strips of orange peel, if desired. Yields 2 portions. Garnish with orange slices and cherries! Cinco de Mayo is a day for Mexicans to celebrate the victory over the French at the battle of Pueblo on May 5, 1862. Many people in the United States of America commonly mistake Cinco de Mayo with the Mexican Independence Day. For many Americans of Mexican ancestry, this day has become a day to celebrate their Mexican heritage, pride and culture. The celebration occurs on the 2nd of November in connection with the Catholic holiday of All Saints’ Day and All Souls’ Day to commemorate family and friends who have died. The traditions is to build private alters in people’s homes using sugar skulls, marigolds, flowers, fruits, pictures and the favorite foods of the deceased. 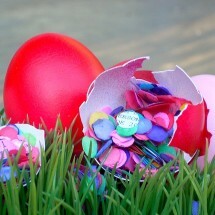 Visits to the graves with a few gifts and decorations are also a must on this day. It commemorates the last week of life of Jesus Christ on Earth, and occurs the last week of Lent and the week before Easter. Most people take the entire week off and go on vacation. The 5th of May is not Mexican Independence Day, but it should be! And Cinco de Mayo is not an American holiday, but it should be. Mexico declared its independence from mother Spain on midnight, the 15th of September, 1810. And it took 11 years before the first Spanish soldiers were forced to leave Mexico. Under Emperor Napoleon III, who detested the United States, the French came to stay. They brought a Hapsburg prince with them to rule the new Mexican empire. His name was Maximilian; his wife, Carolota. Napoleon’s French Army had not been defeated in 50 years, and it invaded Mexico with the finest modern equipment and with a newly reconstituted Foreign Legion. The French were not afraid of anyone, especially since the United States was embroiled in its own Civil War. The French Army left the port of Vera Cruz to attack Mexico City to the west, as the French assumed that the Mexicans would give up should their capital fall to the enemy — as European countries traditionally did. Under the command of Texas-born General Zaragosa, (and the cavalry under the command of Colonel Porfirio Diaz, later to be Mexico’s president and dictator), the Mexicans awaited. Brightly dressed French Dragoons led the enemy columns. The Mexican Army was less stylish. When the battle was over, many French were killed or wounded and their cavalry was being chased by Diaz’ superb horsemen miles away. The Mexicans had won a great victory that kept Napoleon III from supplying the confederate rebels for another year, allowing the United States to build the greatest army the world had ever seen. This grand army smashed the Confederates at Gettysburg just 14 months after the battle of Puebla, essentially ending the Civil War. Mexicans, you see, never forget who their friends are, and neither do Americans. That’s why Cinco de Mayo is such a party — A party that celebrates freedom and liberty. There are two ideals which Mexicans and Americans have fought shoulder to shoulder to protect, ever since the 5th of May, 1862. VIVA! el CINCO DE MAYO!! Smoothies, Coolers, and Yummy Drinks Category…be sure to check it out!